In 1901 the blocks just west of Fifth Avenue around 34th Street were gradually changing. The Astor mansions on Fifth Avenue between 33rd and 34th Streets had been replaced by the hulking and exclusive Waldorf-Astoria Hotel and high-class commercial interests were increasingly converting other brownstone residences. One-by-one the wide homes of West 35th Street were sold off and before 1910 the block would have no fewer than three high-end hotels. But none of them would equal the Collingwood’s impressive architecture or guest register. Robert F. Spalding razed four elegant brownstone-clad homes—Nos. 43 through 49--to erect his new brick and limestone hotel. Construction of the 12-story structure was begun in 1900 and completed in December of the next year. The exuberant Beaux Arts façade, like buildings along the boulevards of Paris, was laden with heavy, carved ornamentation. While some other architects were frosting their Beaux Arts designs with ornate terra cotta decoration, the Collingwood went with carved limestone. At the 11th floor, four immense lounging allegorical sculptures represented the continents of Asia, North American, Europe and Africa. 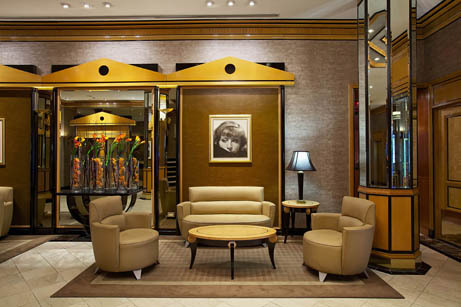 The lobby areas were lavishly decorated with carved marble – or so it seemed. The Artificial Marble Co., Inc., of East 91st Street, provided imitation stone essentially undetectable from the real thing. “By our process of manufacture, we can imitate perfectly any marble or stone in existence” the company boasted. The wealthy guests would never know the guise. Sumptuous Beaux Arts brackets, vermiculated quoins around the windows and a limestone base hinted at exclusivity. 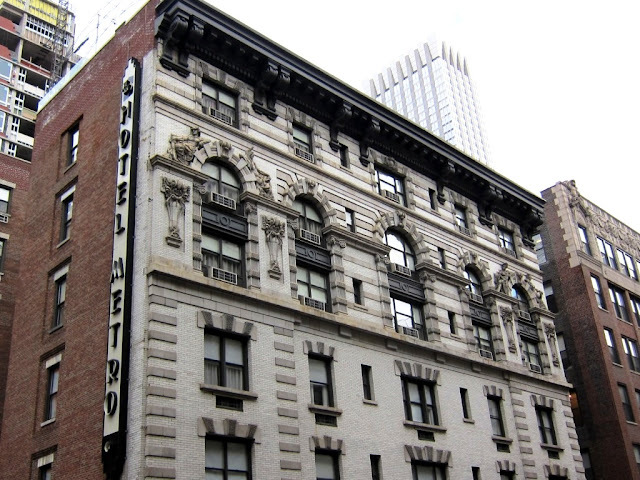 Six months before the hotel was completed, hotelier William F. Bang signed a 21-year lease at $50,000 a year. The projected value of the Collingwood at the time was a staggering $1 million. Final touches were completed in April 1902 and the doors opened for business on May 1. 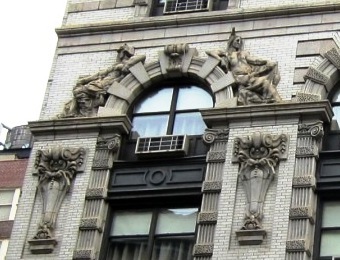 While upscale transient guests visiting New York were welcomed, the Collingwood was mainly an “apartment hotel;” one in which well-heeled residents lived and enjoyed the amenities of a staff without the inconvenience of running a private household. Sculpted allegories of four continents lounge against arches -- here Europe and North America. Trouble came early for the Collingwood when, on the evening of March 6, 1903, Charles Dowdeswell and his wife left for dinner. Dowdeswell was an art dealer with a store on Fifth Avenue and, as was normal, they left their apartment key with the clerk. Later a neighbor notified the captain of the bellboys, Charles Manly, that there was something wrong with the steam pipes in the Dowdeswell apartment. The 24-year old Manly entered with the key to check. Upon their return from dinner, the couple discovered that $400 worth of Mrs. Dowdeswell’s jewelery consisting of pearl necklaces, gold chains and bracelets and such, and a pocketbook with $116 in cash were all missing. Although none of the items were found on Manly, the 24-year old was arrested. Later that year, only a eighteen months after opening, William Bang was broke. Although the Hotel Collingwood was successful, his combined business dealings forced him into bankruptcy in December 1903. The hotel was taken over by the Hotel Collingwood Company, owned by the brothers Joseph T. and Israel Cohen. Couples who regularly appeared in the society pages of the newspapers filled the hotels—like Mr. and Mrs. Vance C. Cheney and Henry Roso and his wife, Julia. And then there were those whose inclusion in the newspapers was not so eagerly sought. Among these were the wife and daughter of the famed singer David Bispham. The Bisphams had been separated for several years when his wife and daughter took up residence. The singer, who was living in the exclusive Royalton bachelor hotel on 44th Street, regularly provided support until May 1907 when the payments abruptly stopped. Mr. Wishart was not moved. 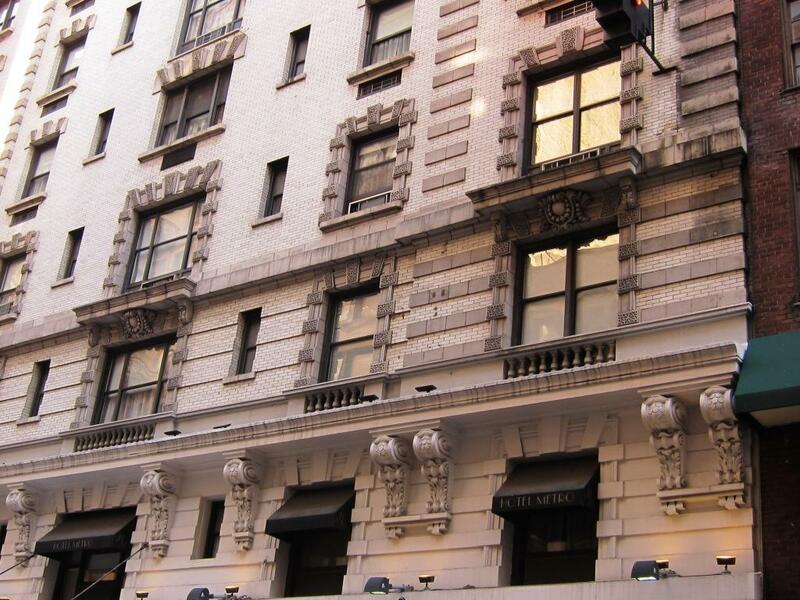 When the Cohens sold the Collingwood to Mrs. Eliza Guggenheimer, widow of Randolph Guggenheimer, in February 1909 the 35th Street block was still upscale. Just days after the sale, $10,000 worth of jewels owned by Mrs. J. R. McComb disappeared from the hotel safe. Mrs. McComb, leaving for a stay in Great Barrington, Vermont, left the jewels on January 25 for safe-keeping. A week earlier, 19-year old Allen Porter Crollus had been hired as night clerk. “It was the first job of any consequent he had had in a year,” reported the New York Tribune. Two weeks after Mrs. McComb left, police Inspector McCafferty heard that a young man named Crollus was “spending money lavishly” on upper Broadway and put Detective Van Twistern to the task of following the boy. After seeing him enter several pawn shops, the policeman searched Crollus. On him were several pawn tickets, jewelry including a diamond and turquoise brooch valued at $2,500 and one-way tickets on the American Line steamship St. Paul to London leaving the following morning. Allen Crollus explained to the police that he had been out of work for a year and needed money badly. The police were unimpressed with his explanation. He was locked up in the Tombs charged with grand larceny. By now most of the mansions on Fifth Avenue around 35th Street were gone. Commercial structures like the marble Tiffany & Co. building, the immense palazzo of B. Altman & Company and the building of Alvin Mfg., silversmiths, had replaced them. 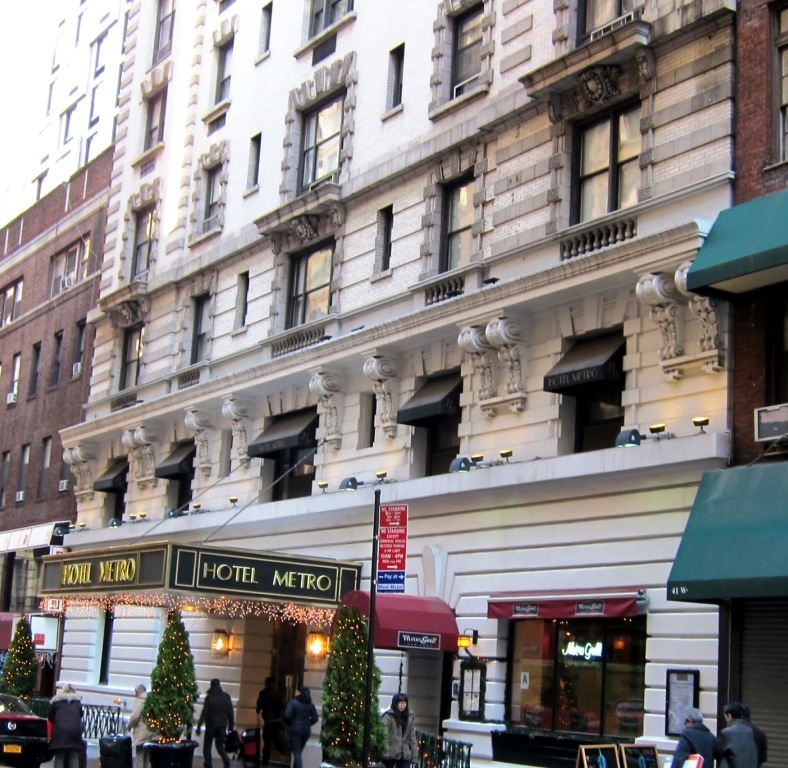 While wealthy residents like Mrs. William H. Moseley still lived here during the winters and summered in Litchfield, Connecticut; in 1913 the Hotel Collingwood’s advertisements now focused on being “half block from Herald Square, the center of New York” rather than its proximity to Fifth Avenue. As late as the 1920s wealthy New Yorkers remained in the Collingwood. James E. Hewitt “turfman and owner of thoroughbreds,” as described by the New York Tribune, lived here. He owned the Hewitt racing stables. Among his neighbors was Joseph E. Schwab, president of the America Steel Foundries and brother of American Steel magnate Charles M. Schwab. If anything can be said about Manhattan, however, it is that times and neighborhoods change. By 2000 the convenient location of the once-grimy 35th Street was attracting out-of-towners. In 2008 a series of modern hotels with national names like Marriott and Hampton Inn began rising on the sites of old loft buildings. In the meantime, the Hotel Collingwood became the Metro Hotel, completely renovated and modernized to attract 21st century guests. Today the former high-toned residential hotel that was home to socialites caters to families on vacation and executives on business trips. And the graceful sculptures of the four continents still lounge, unaffected by the changes to the street below. Glad to find this history! My grandmother and great aunt stayed here for several days in August 1912 before boarding the Oceania for England. very nice that you knew that history of your grandmother. Glad you found the post and found it interesting! Thanks for the history Tom. I worked and lived in the Collingwood in the 1970s when, at the time, my family owned it. Very nice hotel . I stayed in 1989 when came from Puerto Rico. The style remines me of 1930's. Movies.